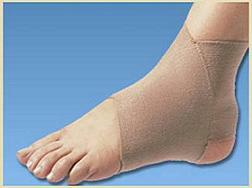 Orthopedic ankle braces are widely used to treat many milder forms of ankle sprains as a first-line treatment. They are used equally as post operative stabilization of many ligament repairs and fractures, many times in place of a cast. 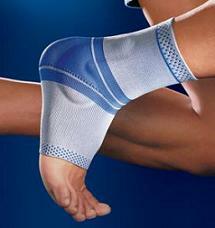 There are many advantages to using orthopedic ankle braces over cast application, and many disadvantages as well. Your doctor / surgeon will need to determine if bracing, and if so, what brace type, is most applicable to your individual situation. 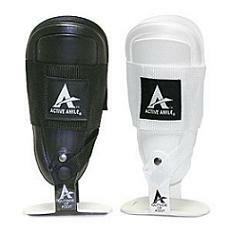 Let’s first get an idea of what are the most common ankle braces on the market today. While we don’t claim to know them all, and there are literally hundreds, we’ll touch upon some of the ones that most people will commonly encounter. The types of injuries that ankle braces are most typically used to treat are ankle sprains, ankle fractures ,tendon injuries, ankle arthritis , or diabetic joint disease of the foot and ankle to name a few. 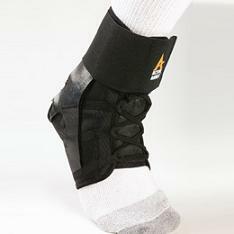 Like we said earlier, many times, orthopedic ankle braces are used as the primary treatment of an injury, while at other times they are used as the patient rehabilitates back into activity and sports and uses the braces as long term protection and support. If you are here, looking for what kind of brace best suits your needs, you need to know exactly what, and how severe your injury is/was and what you expect to accomplish with bracing. If you're looking for a brace that you can play sports with, it may be a vastly different brace than if you are looking for one that limits motion while recovering from an injury or surgery. The support that offers the least protection, but the most mobility is the pull-up variety that is either knitted or made of some type of elastic fabric. These braces are often used for gentle support and for treatment of tendonitis, swelling and general ankle pain without any instability of the joint. Some of these supports have gel pads incorporated into the fabric; strategically located behind each malleolus (knob of the ankle) to gently “massage” the tendons to help relieve pain and reduce swelling (see below). Most ankle braces are made of a softer, pliable material that is typically washable and may also have plastic inserts that fit into pouches on either side of the brace to offer additional restraint and support to the ankle during activity. 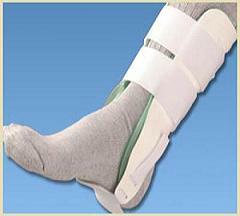 The most common ankle brace example is the lace-up variety. This type offers moderate support and protection, but is not as rigid or restraining as others. These braces are meant to be functional; to allow for sports and work participation. As we climb up the “ladder” of ankle braces, we start to see those that are constructed of more rigid materials, yet are made with various types of “hinges” to allow for fuller up and down ankle motion. Others are made with a hard plastic outer “shell” and is padded with materials such as a gel, or air filled cushions. This brace type can also be used to treat and protect ankle fractures because the protective outer shell guards against bumping the bone “knobs” (malleoli) of the ankle. Still, others are made to withstand high levels of sporting activity and protect against injury, all the while allowing for maximum mobility of the ankle. 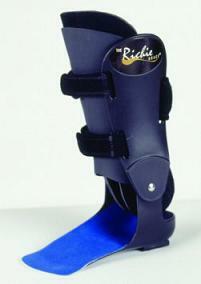 The picture below represents a highly “functional” brace used in th4e sport of soccer. Notice the “shin guard” in addition to the hard aside panels. Soccer players get kicked a lot!